This eBook is a must-have for any theatre or stage practitioner looking to add a strong piece of stagecraft to their shows or performances. This eBook is the definitive reference on the Kabuki Drop. 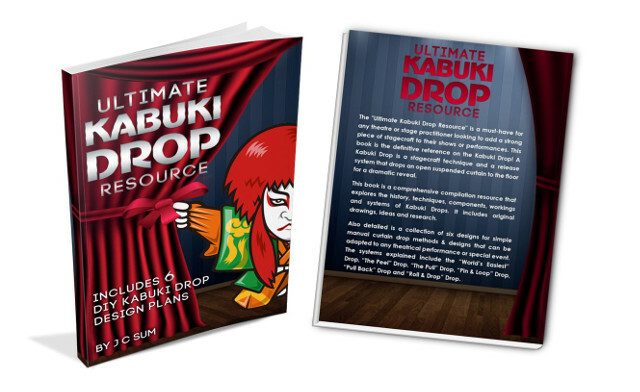 The “Ultimate Kabuki Drop Resource” is a must-have for any theatre or stage practitioner looking to add a strong piece of stagecraft to their shows or performances. This eBook is the definitive reference on the Kabuki Drop. This eBook is a comprehensive compilation resource that explores the history, techniques, components, workings and systems of Kabuki Drops. It includes original drawings, ideas and research. This is an instant download eBook. The download link will be emailed to you in the order receipt upon purchase. The full-colour print book can be purchased here.